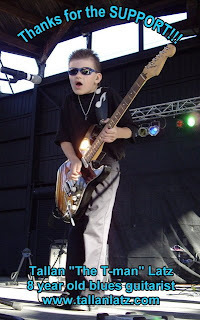 Tallan "T-Man" Latz is an 8 year old Blues burner who just loves the SRV. 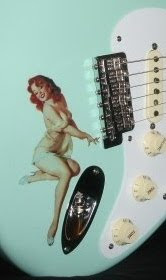 The young Wisconsin bluesman is making the scene throughout Wisconsin & Illinois. If you live in that part of the US, you'd better catch the T-Man. The tunes on Tallan's myspace include a couple SRV numbers as well as BB's Thrill is Gone, on which T-Man sings with conviction equal to his guitar playing. Esp. check out The Sky is Cryin'. While some kids play guitar video games, Tallan Latz prefers the real deal.